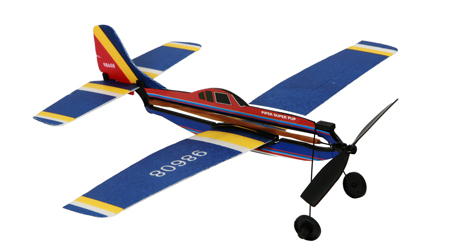 Rubber band glider plane kit. Do it yourself environmentally friendly rubber band powered glider! Great outdoor toy for simple entertainment in the garden, at parks or picnics. All parts necessary to assemble and fly the glider plane are included. Just wind up the propellor to tighten the rubber band then let loose with a gentle throw! Rubber bands, so many uses! Please not that design and colour may vary from that of image.